Reservists say IDF ordered check for terror tunnels along Lebanese border, despite repeated reassurances that no threat exists. The Chief of the Northern Command, Major General Yair Golan, met last month with the mayors of communities near Lebanon and addressed concerns from residents that Hezbollah is actively digging tunnels toward Israel. Golan said that the IDF is prepared to deal with any attempt to act against the inhabitants of the region, including against Hezbollah. However, no security protocols have been enacted yet to actively combat the problem. But despite statements by military leaders, sources say that, quietly, the IDF acknowledges a very real threat from terror tunnels in southern Lebanon and has not ruled out the possibility of their existence, Arutz Sheva learned Wednesday. Reservists who have recently arrived to serve the Lebanese border told Arutz Sheva that their own IDF officers have great concern for the presence of tunnels from Lebanon to Israel, and that instructions were given along the northern borders to dig to search for such tunnels. The IDF decided to contact the local military outpost on the Lebanese border as well, due to high fears of the presence of a tunnel just below the military post and that Hezbollah terrorists could decide to blow up the tunnel, causing mass casualties. Soldiers also stated that Hezbollah terrorists have come very close to Israel's borders before, during infiltration attempts, and that "they know everything they need to know" to launch an attack. IDF rejected the claims and said that "the IDF does not specify about preparations on the border." The concerns are made particularly real given the IDF's controversial decision earlier this year to remove guards posted near several Gaza belt communities over budget cuts, a decision made the more alarming given the extensive terror tunnel system exposed in Operation Protective Edge which resulted in numerous IDF casualties. Those tunnels were revealed in reports to have been planned for use in a massive incursion on Rosh Hashana, the Jewish New Year, during which the Hamas terror group planned to commit a large-scale massacre of Israelis living in communities near Gaza. Geologist and res. 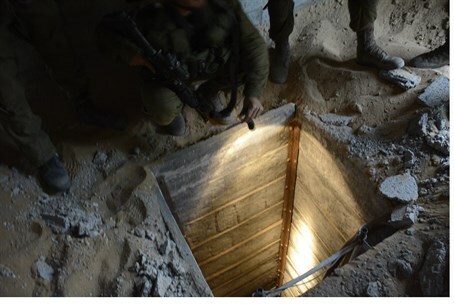 Col. Yossi Langotsky last month told Arutz Sheva that he had tried to warn the security establishment about the tunnel threat from Gaza for nine years, but that his warnings fell on deaf ears. Langotsky indicated that a similar threat exists on the Lebanese border. He pointed to the close relation between Hezbollah and North Korea, which has an advanced tunnel system under the Demilitarized Zone (DMZ) with South Korea, and which has reportedly played an important role in helping Hamas dig its own tunnels from Gaza, as well as providing them with rockets.